With so much to see at once at e3, we’re not surprised that there is STILL more to cover. At E3 2017, Alienware threw their own collection of new PC peripherals into the mix, showcasing new mice, keyboards, and monitors. 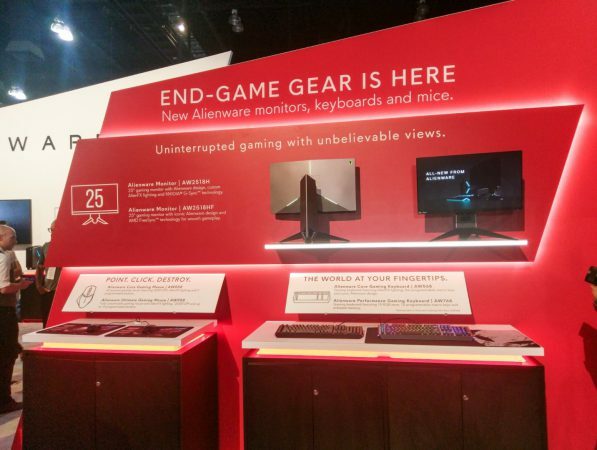 Alienware went with two tiers for the mice and keyboards, with the lower end being of a very approachable price point while the higher end is more feature-heavy. The two monitor choices give gamers two flavors to choose from for their gaming visuals. 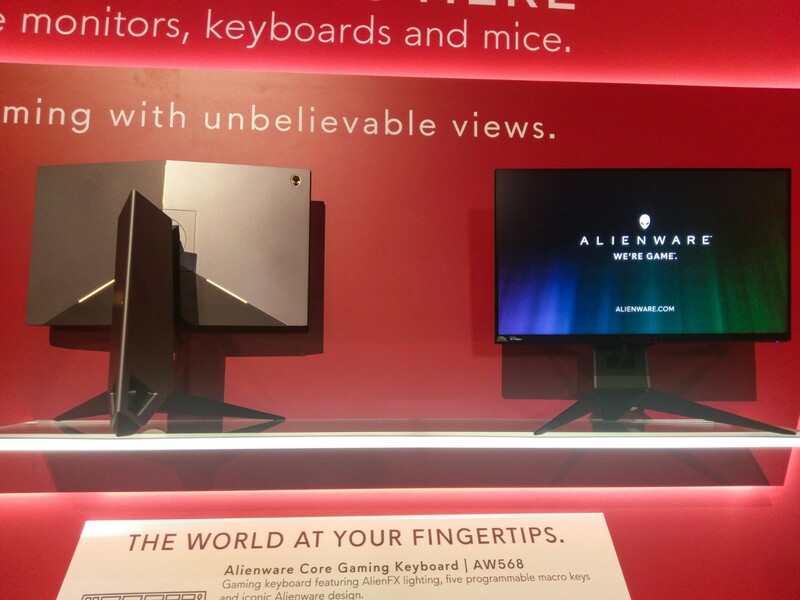 Alienware gave us plenty to cover, so let’s dive into the highlights. Starting out with the lower tier, the Alienware Advanced Gaming Mouse (or AW558) gives you the gaming mouse essentials in a $49.99 package. The AW558 is a right-handed, programmable, 9-button mouse with customizable LED’s and three levels of customizable DPI switching. The Alienware Elite Gaming Mouse (AW958) goes for $89.99, takes all of the features of the AW958 and goes even further. With the AW958, you now get five levels of customizable DPI switching as well as adjustable physical components. You can tweak the AW958’s ergonomics with a set of swappable side grips and a 3-position palm rest. The AW958 also has slots for inserting weights, giving gamers control over the general weight of the mouse. The first of this set of keyboards, the Alienware Advanced Gaming Keyboard (AW568), comes in black, and runs for $89.99. The AW568 uses KaiHua brown spring-loaded switches, features five programmable macro keys and has two lighting zones for its customizable key LED’s. You also get Anti-Ghosting and N-key rollover on all keys to ensure that not even your most unique of key combinations gets ignored. The keys themselves have a lifespan of 50 million keystrokes. The Alienware Elite Gaming Keyboard (AW768), comign in silver, has everything the AW568 has and brings more to the table for $119.99. The AW768 houses on-board memory for storing user created macros, ups the amount of customizable lighting zones to 13, and uses a volume wheel in its media controls. The Alienware Gaming Monitors AW2518H and AW2518HF have 24.5” displays with a max resolution of 1920 x 1080, a brightness of 400 nits and a contrast ratio of 1000:1. Each monitor has 3-sided narrow bezels and a 1 millisecond response to ensure crisp gameplay and fast response times. The difference between the two models rests in the technology each use for handling screen tearing. The AW2518H uses NVIDIA G-SYNC and goes for $699.99. Meanwhile, the AW2518HF runs AMD FreeSync and costs $499.99. 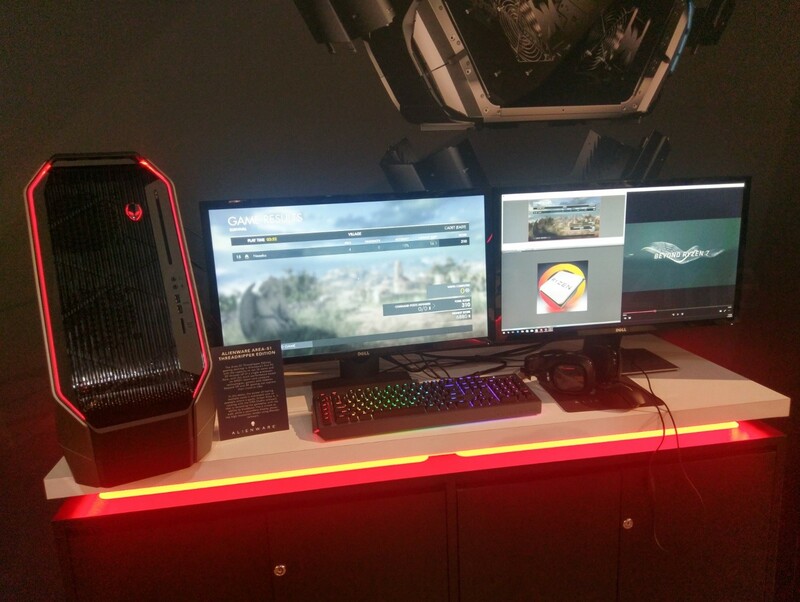 They also showcased their new and soon-to-be released edition of their Alienware Area-51 desktop, powered by the newAMD Ryzen Threadripper processor. Scheduled to be released in late July 2017, Dell will offer Alienware Area-51 configurations with AMD Ryzen Threadripper built-in, making these first the 16-core/32-thread Area-51’s. These will also be the first fully-built PC’s to offer configurations with AMD Ryzen Threadripper.